↑ Pilkington, Ed (मार्च 10, 2011). "Forbes rich list: Facebook six stake their claims". The Guardian. UK. पहुँचतिथी मार्च 30, 2011. ↑ Napach, Bernice (जुलाई 26, 2013). "Facebook Surges and Mark Zuckerberg Pockets $3.8 Billion". Yahoo! Finance. ↑ Hiltzik, Michael (मई 20, 2012). "Facebook shareholders are wedded to the whims of Mark Zuckerberg". Los Angeles Times. 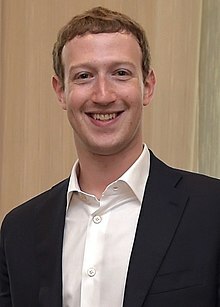 ↑ "Mark Zuckerberg". Forbes (English में). पहुँचतिथी मार्च 5, 2018.